Appetite for Awareness 2012 is over, but the office is still buzzing with excitement. When you focus on preparing for an event for months and months, you can’t help but feel a sense of relief and happiness over the success of the event. I joined the National Foundation for Celiac Awareness (NFCA) team back in May, so this was my first time at Appetite for Awareness. Leading up to the event, I attended planning and update meetings and absorbed all the fine details that go into coordinating an event of this size. Last week, NFCA staff and our wonderful event planners, Phyllis and Ed, went over the final plans, and I thought I knew what the event had in store for all its gluten-free guests. I never could have imagined how big Appetite for Awareness really could be, and how much it could mean to the community. The venue was the Historic Strawbridge Building in Center City, Philadelphia. For those of you who have never seen it, the building is unbelievably beautiful. It used to be the Strawbridge & Clothier building, but was just converted into a venue for special events. It has that historic look to it, with the grand staircase in the back, low hanging, bright chandeliers, and a working fountain in the walkway that divides the massive floor space. 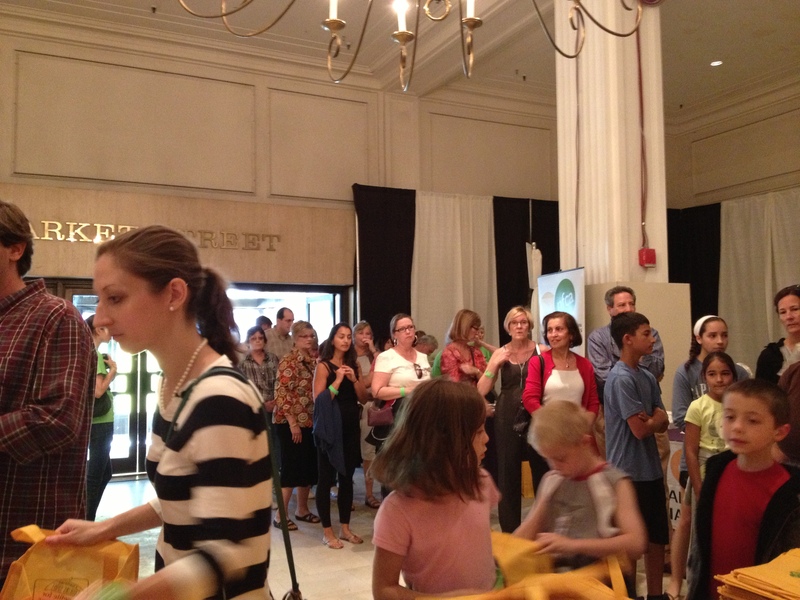 On Sunday, tables snaked through the main hall, loaded with vendor tables all handing out gluten-free samples to the 1,500 attendees. 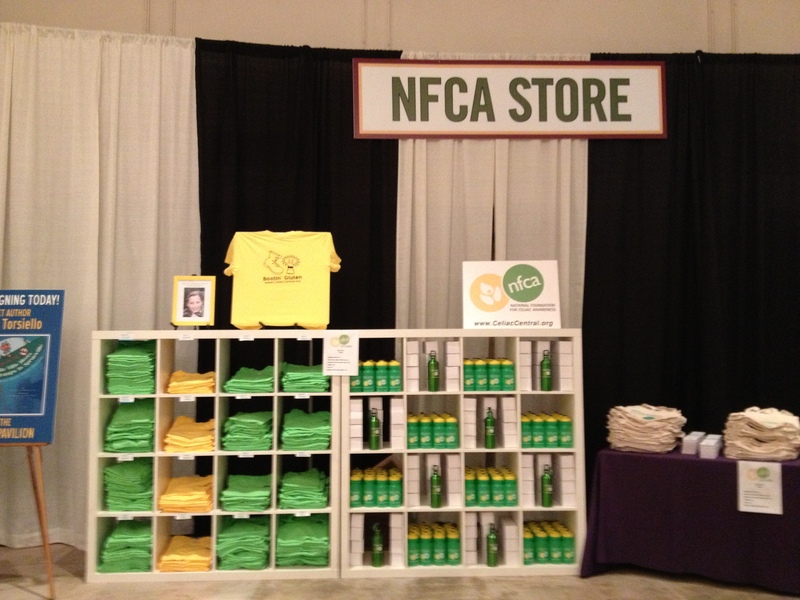 So here’s how Appetite for Awareness goes: You come through the door, grab your NFCA tote bag and start eating! 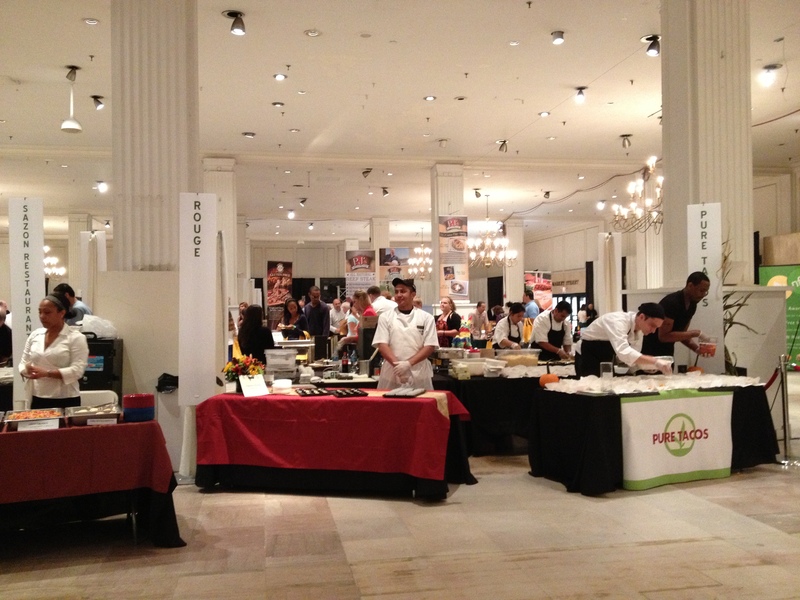 All of the vendors and restaurants get their own table and they serve only gluten-free food. Even better, all of the restaurants in attendance are trained by NFCA’s GREAT Kitchens program, a training course that teaches chefs all the ins and outs of preparing gluten-free food safely. This is what makes Appetite for Awareness so special. From the pasta samples served by the restaurants, to the brews chilling in the beer garden, it’s all gluten-free. There are no questions to ask your server. There are no concerns about cross-contamination, because nothing containing gluten comes through the door. Everyone there knows what the gluten-free diet is and why it’s so important to those living with celiac disease or non-celiac gluten sensitivity. For once, people on the lifelong gluten-free diet can just relax, eat and have a good time without making special preparations, calling ahead or packing their own snacks. The line to get into Appetite for Awareness wrapped all the way around the outside of the building! I didn’t get to try all of the dishes, but from the massive lines of people eagerly devouring their samples while reaching for another one, I know the food was delicious. 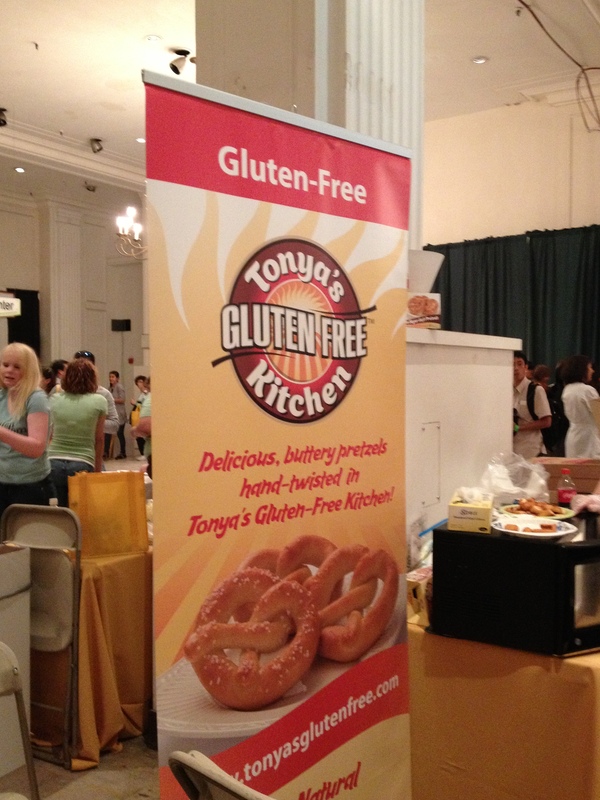 A returning favorite were the soft pretzels from Tonya’s Gluten-Free Products, which earned rave reviews at Appetite for Awareness 2010, too. I saw people running to go have a pretzel or two (or three or four). Kids were covered in pizza sauce, and sticky fingers were everywhere. It was an awesome sight. People were talking about how excited they were to have their first soft pretzel in years. Personally, I was super excited to meet the people that I talk to on social media all the time. I met Erin Smith of Gluten-Free Fun, Amie Valpone of The Healthy Apple, and the Appetite for Awareness honoree himself, Michael Savett of Gluten Free Philly. NFCA honored Michael Savett at the event for his major contributions to the gluten-free community living in the Philadelphia area. When his son was diagnosed with celiac, Michael started teaching restaurants about the gluten-free diet and kept track of the restaurants that could cater to his son’s special dietary needs. Instead of keeping the information to himself, Michael started Gluten Free Philly for everyone in the area to benefit from. A driving force in creating more availability for gluten-free options, NFCA would once again like to thank and congratulate Michael for his efforts. Check out the tribute video NFCA made (with the help of Michael’s friends and family) to say thank you. I had a blast at Appetite for Awareness 2012, and based on the tweets and Facebook comments, it seems like everyone who attended agrees. None of this would have been possible without the generosity of our sponsors, the support of the NFCA board and advisory council members, and of course, our amazing volunteers and staff who put in countless hours to make Appetite for Awareness 2012 a fun and safe event for the gluten-free community. Visit the NFCA Facebook page to see some of my snapshots from the event and stay tuned for the professional photographer’s pictures to come. While you’re visiting the Facebook page, tell us your favorite part of Appetite for Awareness! There are so many people to thank and recognize for their contributions to Appetite for Awareness, especially Thomas Jefferson University Hospitals, KYW Newsradio 1060, PREIT, Mercedes-Benz of Fort Washington and West Chester. Click here to see all of our amazing sponsors and participating restaurants and vendors. 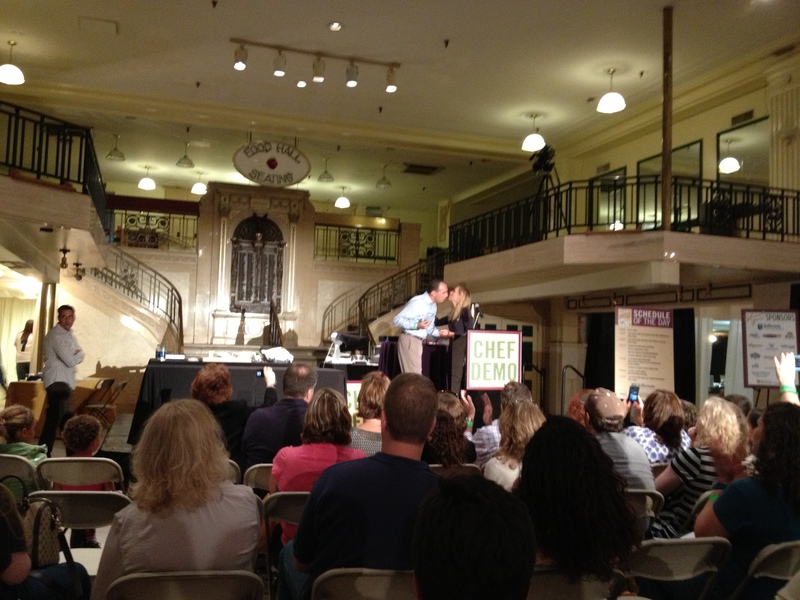 Thanks to all who came out to make Appetite for Awareness such a memorable event!